Ceramic is amazing stuff. It’s extremely strong and durable, has an amazing capacity for heat absorption and is also stable at high temperatures. This could well make ceramic an excellent component in materials or biomaterials, were it not for their tendency to shatter at any given opportunity. The structure of ceramics as they are typically produced allows even very minor structural flaws to propagate within them easily, thus causing a crack to ‘spread’ through a solid layer of ceramic with ease. Therefore, forms of ceramic that replace flexibility with rigidity, or at least absorb mechanical forces with more efficiency, would be advantageous in applications such as insulation, filtration systems and medical devices. A team collaborating across Brown University and several institutions in China has recently published a paper claiming the successful formulation of ceramic nanostructures that form lighter, sponge-like substances rather than rigid, brittle sheets or blocks. This new type of ceramic insulates against high levels of heat, but is also much more ductile and deformable in a superstructure. Ceramics are oxides of a variety of elements such as carbon, silicon, titanium or zirconium. Therefore, they can be super-strong, absorb a lot of thermal energy and are very rigid. They are known for uses that require durability or resistant to high heats, such as high-end cookware, kitchen fixtures, vessels and floor tiles. However, ceramics are also at risk of cracking or scratching due to their lack of flexibility. Ceramics also tend to be non-porous, which is great if you want a material that does not absorb smells or dirt, but not if you want it to be lighter or more deformable. Now though, a team of scientists from various labs in Chinese universities and the School of Engineering at Brown University recently reported the formation of nanostructure-based ‘soft’ ceramic in the journal Science Advances. Ceramic is incompatible with a technique known as electrospinning, which may be most likely to form nanofibres of this substance. Nanoscale ceramics could also be made using laser 3D printing, but that process would be costly in terms of time and money. The main development this team has made is to successfully form ceramic nanofibres using a method involving the extrusion of liquid ceramic into these fibres through a syringe, under air pressure. The fibres are then ‘spun’ into a ball with a sponge-like consistency. This new form of ceramic allows for deformation without cracking, combined with vastly improved resilience. For example, it can absorb up to 29.6 microjoules per centimetre cubed at 50 percent of its capacity for strain. The ceramic sponges also retained those properties when exposed to extreme heat; one form retained its bouncy properties at approximately 1300 degrees Celsius. This new type of ceramic production may prove useful in water purification concerns. Titanium, which has potential antimicrobial properties, can be incorporated into air-spun nanofibres as an oxide or dioxide. Therefore, this ceramic sponge could eliminate micro-organisms from water on both a physical and chemical basis. Nanofibre-based ceramics could also be a considerable boon for future medical devices and implants, as they can always benefit from materials that are light and strong without being too rigid or liable to shattering. These new ceramics are also as stable, in a chemical manner, as conventional ceramics, which may reduce risks connected to adverse reactions to tissues with which they may be in contact. Titanium is also a suitable material for medical devices, as it is chemically inert and biologically non-reactive. Some other elements that could make up nanofibre-type medical-grade ceramic include silicon and zirconium. These ceramics are also much more elastic than the normal solid variety, and can stretch in response to electrical stimulation. Therefore, they may be used in devices that are required to move or flex automatically in response to changes in the ambient current or voltage. The ceramic sponge also has the advantage of being truly three-dimensional, whereas electro-spun nanofibers form thin sheets of latticed atoms. The ceramic sponges are also highly porous, having 99.7 percent porosity in some cases. They also have ultra-low densities, which may increase the range of their applications as well as their portability. The team’s initial sponges had sizes of up to 40 mg/cm3, but believe that this could be scaled up as their production process becomes refined and developed. The actual nanofibres can range from 47 to 815 nanometres in diameter, which is a function of the liquid ceramic and its concentration. 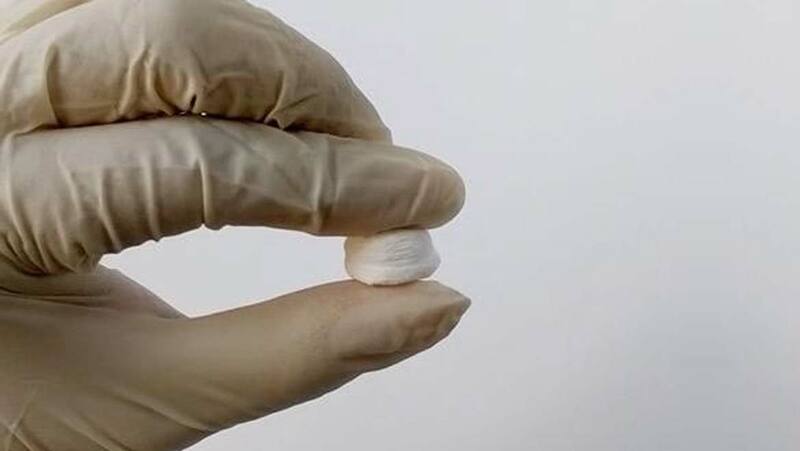 This team, led by Hui Wu of Tsinghua University and Professor Huajian Gao of the School of Engineering at Brown, may have revolutionised the production of ceramic nanofibres and subsequent ‘squishy’ forms of ceramic. They report that their air pressure-powered spinning technique is more cost-effective than electro-spinning or 3D printing, and does not require the use of high-voltage electric fields. In addition, the ceramic liquid to be electro-spun can be ‘jammed’ at a nanoscale level, due to the high conductivity of inorganic salts that may need to be included in this precursor. On the other hand, scientists are free to use these salts in the course of the new presence, because of the lack of electricity needed. These ceramic sponges are an exciting new material which should be ultra-light, strong and porous while being resistant to being flattened. As an example, one TiO2 sponge could take 200 kPa of stress at 50 percent strain. The sponges are also highly absorbent – one 2mg sponge demonstrated the ability to absorb just over 100mg of water, or about fifty times its own mass. This new form of ceramic may have a fantastic range of uses, especially in the areas of water treatment, medical devices or automation. Wang H, Zhang X, Wang N, Li Y, Feng X, Huang Y, et al. Ultralight, scalable, and high-temperature–resilient ceramic nanofiber sponges. Science Advances. 2017;3(6).